The bronze frog sculpture 'Jeremy Fisher', a Beatrix Potter figure (sculpture by Albert Guibara) has enjoyed three of Susan's gardens. "He is the happiest he has ever been here, fishing in the creek." When Susan purchased this property, only the mature trees existed on site - and with the help of Will McGowan, she carefully chose every single plant that you will see on tour. Many are sentimental, gifts from friends, or have a personal story. Many have been propagated from the plants of fellow garden club members. This garden is 100% organic, sustainable, with active vermiculture on site - Susan has done worm composting for over 40 years. When Susan’s daughter initially saw the property, she knew it was exactly what her mother had been searching for; peaceful, historic and a blank canvas. Susan remembers when she first stepped onto the property, “ The magnificent trees welcomed me and I thought, I have come home.” Susan has truly created an oasis. There are so many exciting elements that you don’t see any place else. She explains, “I don’t have a single favorite but I love white and green." If you notice, when there is a choice, she always chooses variegation. “When I am in the garden, I feel like my friends are with me. I have planted and propagated so many of their gifts. I actually call the plants by my friend’s names. I often wonder if the trees and cobblestones in the lower garden which were salvaged from the San Francisco 1906 earthquake could talk, what stories they would tell? I am grateful to be surrounded by California history. Drought tolerant, it is important to avoid regular watering within the oak's drip line (canopy), since wet soil in the summer increases infection rates by soil borne Phytophthora diseases like sudden oak death. Bloom: Yellow, Cream, Green- year-round flowering season. Water: Once established, avoid direct summer watering. Best to plant near an irrigated area as they will stretch their roots to obtain the water they need. Sold under the trade name of SNOW FOUNTAINS, it is a slow-growing, weeping, ornamental cherry that is sold in a variety of forms: (1) a compact, naturally weeping tree (most other weeping cherries are topgrafted) that typically grows 8-15' tall, or (2) a compact tree topgrafted at 6' or (3) a ground cover. As a weeping tree, its cascading branches dip all the way to the ground, giving the appearance of a white or snow fountain when covered with pure white flowers in early spring. Dark green leaves (to 3 1/4" long) turn attractive shades of gold and orange in autumn. This cultivar is known by several different names, including 'Snofozam', 'White Fountain' and 'Snow Fountains'. The bigleaf magnolia, is a deciduous magnolia native to the southeastern United States and eastern Mexico. This species boasts the largest simple leaf (30” long) and single flower of any native plant in North America. This tree likes loose, undisturbed rich soil. This tree will likely succeed in sites that closely mimic its natural habitat and where it is protected from strong wind which can tatter its large foliage. This plant is generally problem free. Bloom: White fragrant flowers are up to 1’ (May/June). Blooms are not produced until the tree is 12 years old. This small evergreen tree comes from South America. It has broad leaves and is sensitive to cold. It is a large shrub or small tree of upright growth and notably fine textured dainty foliage. Specimens have measured up to 40’ tall. Minute, almost unseen flowers are yellowish-green, intensely vanilla or chocolate scented in late winter or early spring. Its cultivar “Variegata” has leaves variegated with creamy white so it lights up dark garden corners wonderfully. Attracts Birds. 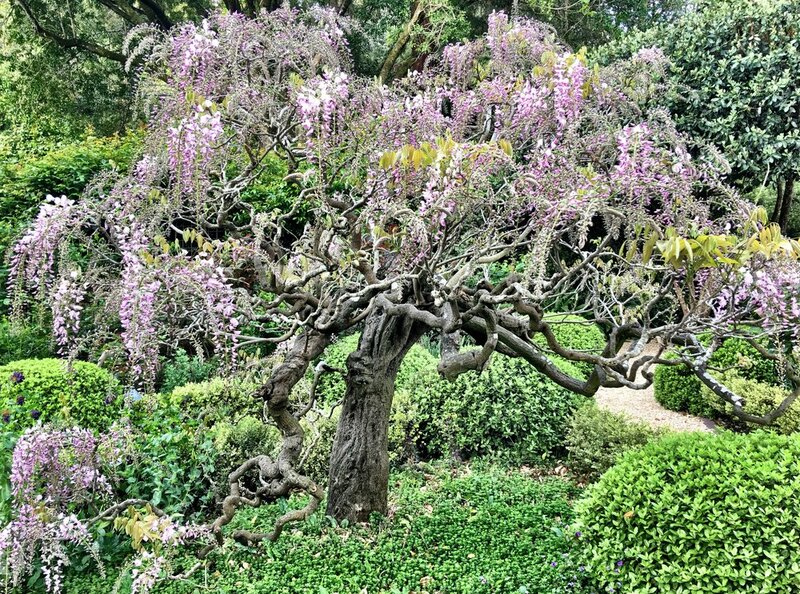 Commonly called Chinese wisteria, this is a deciduous vine that grows vigorously to 25’ or more and features 6-12” long racemes of mildly-fragrant, pea-like, blue-violet flowers in spring when the foliage is just beginning to expand. Flowers give way to pendant, velvety, bean-like seed pods (4-6” long) which ripen in autumn. Over time, the stems of this vine become twisted, trunk-like and massive. Tiarella are commonly known as foam flowers, because their masses of tiny, spidery flowers atop short stalks collectively look like foam on a stick. They can tolerate deep shade but prefer the dappled sunlight found in woodland gardens. In deep shade their foliage color may fade. Tiarella are low maintenance plants and can remain undivided for years in the garden without losing vigor. Susan’s garden hosts a range of hellebore varieties. 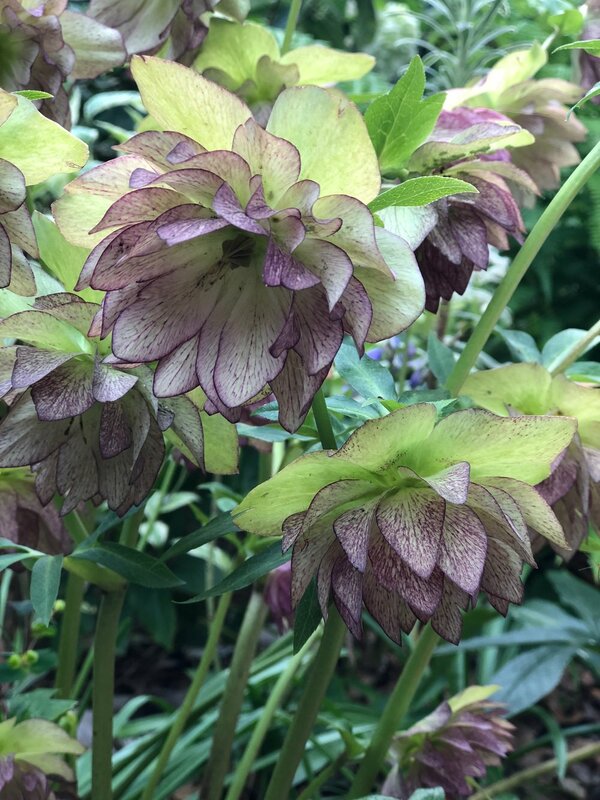 The most popular hellebores for garden use are H. orientalis and H. x hybridus. 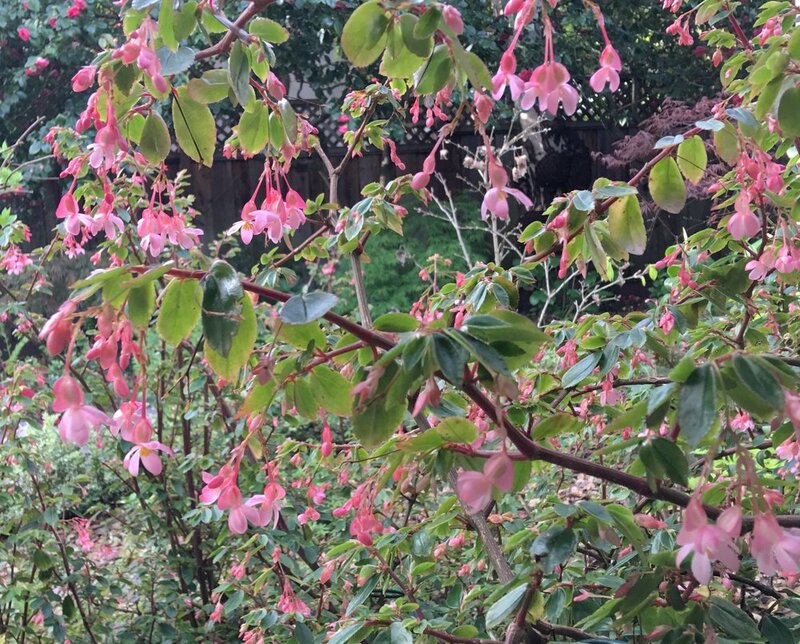 The toothed, leathery leaves and distinctive blooms make a happy addition to the spring garden. Best grown in groups in a woodland or shady border. Year round foliage is fairly deer and rabbit proof. 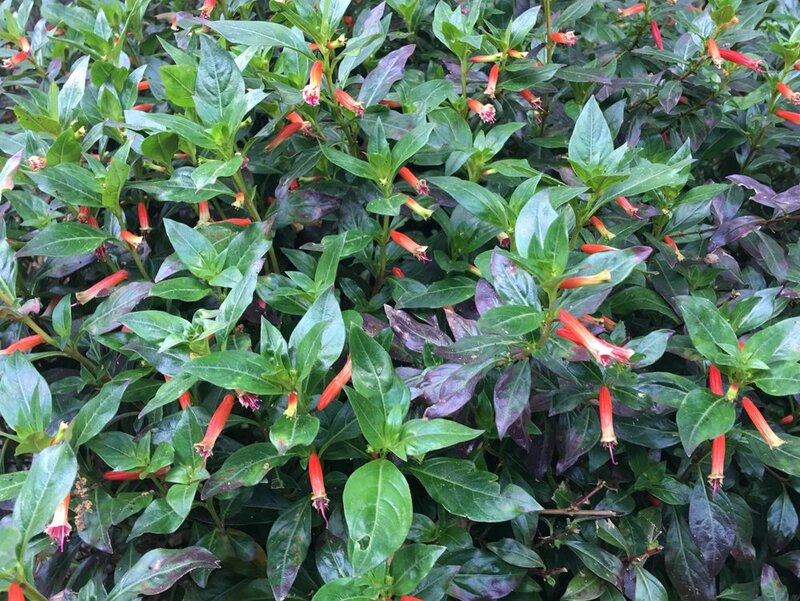 Cuphea are grown for their tubular, irregularly shaped flowers which have a long blooming season. Cuphea can be grown as annuals where not hardy. Use as bedding or in a border. Sticky foliage. Plants often attract hummingbirds and butterflies. Additional research shows promising results for use of cuphea as a rotational crop; it appears wheat and corn yields increase when grown after a year of raising cuphea. Prune in spring. 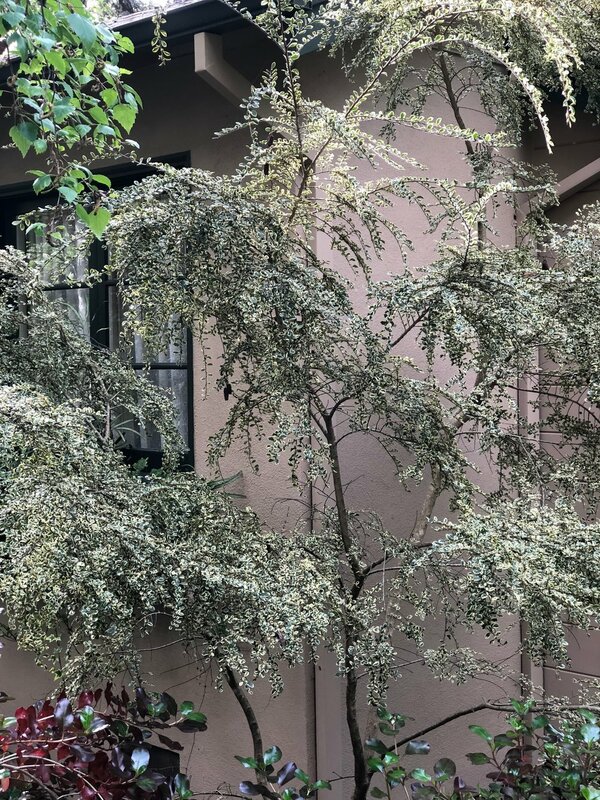 Coprosma covers more than 90 different species of dioecious evergreen shrubs and small trees which are native primarily to New Zealand, Australia, Polynesia and Indonesia with 13 species native to Hawaii. Species plant are commonly called mirror plant in reference to the glossy reflective leaves. Plants grow in both upright and creeping forms. Leaves appear in a variety of colors, depending upon species, and are usually small, thick and leathery. This vigorous, variegated Acanthus perennial has striking, bold leaves with deeply cut white margins and splashing blooms. Makes a large clump with 4’ to 5’ tall ornamental flower stalks of pink and cream in summer. It makes an outstanding accent in the shade garden, perennial border or trouble areas. A scrambling succulent sub-shrub with bright green leaves and clusters of small coral pink flowers. Prefers half -shady light conditions. A must have in the shade. Ligularia have glossy, deep green foliage with a purple underside. Foliage can be quite large and round to heart shape to thin and deeply serrated. Flowers are orange-yellow to yellow and can look a bit like a black-eyed Susan or along the lines of a yellow delphinium. A long-lived plant that does well with good but not perfect care. They do not like to dry out and will not tolerate dry soil conditions. Easily grown in average, acidic soil. Foliage will usually burn in full afternoon sun. Tolerates drought and dry shade (rhizomes hold moisture) once established. Clumps spread somewhat slowly but will form attractive colonies over time. Foliage of Epimedium sempervirens is evergreen in warm winter climates, but semi-evergreen to deciduous north of USDA Zone 7. Any foliage that does survive winter should be cut back in late winter prior to emergence of new growth. Mass in woodland gardens, wild gardens or naturalized areas. Also effective in partially shaded areas of rock gardens and border fronts. Grows well under trees. 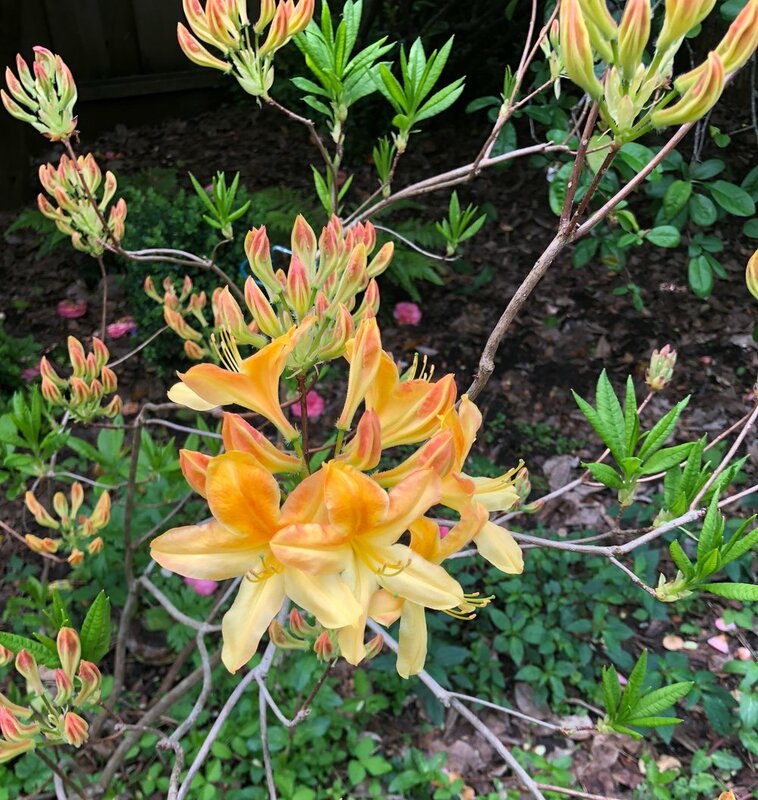 An extremely hardy selection that provides a massive display of vibrant golden yellow/orange single blooms with lush, bronze-tinged green foliage. The small mounding form is excellent for massing in shrub borders, or for use as a bold landscape accent. Deciduous. These azaleas thrive in sunshine. Deciduous azaleas, like other azaleas and rhododendrons, need a well drained, acidic soil. Prune immediately after bloom to prevent cutting off next year’s buds.